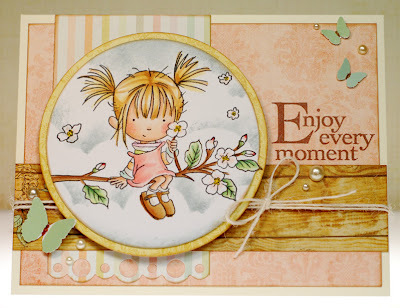 It seems like it's been sooo long but now it's finally time to start previewing the new Sweet November stamps for May. 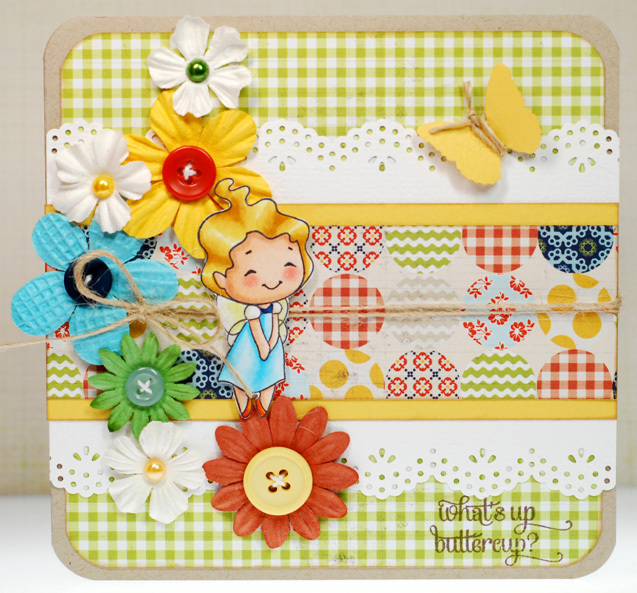 Before we dig in and get our hands dirty I want to shine the Sweet November Guest Gal spotlight on an uber talented and upbeat card maker whom I'm pretty sure I've been following since I first started blogging... please say a happy hello to Kadie Ensley! Now it's time for Kadie to answer the Sweet November questionnaire... which I always look forward to reading! My personal style is VERY laid back. I'm a jeans and sweater gal all the way. 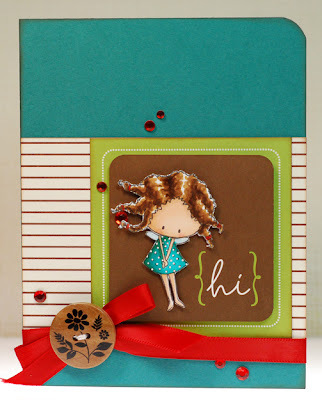 My card making style is similar in one way, I usually always start with the same basic foundation every time and build up from there. After that I like to try different things and can be somewhat of a perfectionist at times...ie: I do all my stitching by hand. Music! I love music of all kinds. The 80's! Oh, wait, I did live the 80's and I had a blast! Some people might say those were crazy times, but it was a fun decade to grow up in. Haha, I want to go back to the future! I would also love to visit the time and place in history when Jesus was alive. I can only imagine what that would have been like. Oh, this is a hard one because I could see myself as any of them at one point or for different reasons, but I think I will go with elf. I think elves generally spread joy and I would like to have that job! If you are a fellow Gleek, which character from McKinley High do you most identify with? Tina. She is quiet a lot of the time, but that makes it all the more compelling when she does have something to say. She also has her own style and is not afraid to be who she is in the face of adversity. She is kind and sensitive to the needs of others. I only wish that my guy had killer moves like hers does!! Alrighty, so tomorrow Kadie is joining Nancy, Marion,and myself and we will be kicking off the May Sweet November release previews! You won't want to miss sneak peek week both here and over on the ATS blog... there's a brand new character from CC Designs being introduced over there today that I think you will totally adore. And as always there are chances to win all of the new goodies so don't miss out! Ok, last night I finished reading A Feast for Crows... OMGosh, so many cliffhangers! And I don't think that there will be many resolutions to those cliff hangers as I have read that the fifth book, A Dance with Dragons, takes place during the same time frame but follows the characters who weren't featured in A Feast for Crows. That means that I will have to wait to find out what has happened until the sixth book is published in a few years! Argh! I've got lots to keep me busy today so I won't be reading at all. Though I will be getting ready for new Sweet November and ATS previews that are starting up this week so be sure to check back tomorrow when I'll be kicking off the new release fun! Hope to seen ya then! My card today is rather bittersweet... I made it for the 200th Flutter By challenge. And sadly this challenge will be the last one at Flutter By. I've enjoyed playing along in Danni's challenges for a couple years now so it will be kind of strange not having them to look forward to each week. Still, even though I will miss the challenges I couldn't miss making one final card for them. The challenge this week is a sketch so that took all the guess work out of the card. All I had to do was find the right papers to go along with this altered Anya that I put together. Even though the Flutter By challenge requires either a butterfly, fairy or angel to qualify, I always liked to have a fairy on my FB cards. So I thought it would be fun to alter up a little Anya fairy. I chose Sitting Cute's body with Princess Anya 3's head (minus her crown), then once she was glued together I added some vellum butterfly wings for her to flutter away with. The papers are all October Afternoon Sidewalks because the bright, happy colors totally caught my eye. And yes, that's another Studio Calico wood veneer embelly, just like the birds from yesterday. I'm really diggin' the different look that these cute things add to my cards. Any crafting plans for this weekend? Nothing special on the calendar for me but maybe I'll get into my crafty room on Sunday to do a much needed clean and organize. I think that I've been bitten by a spring cleaning bug and I would love a few solid days to just totally go through and take stock of everything... maybe even find new homes for some of it that have been going unloved. No telling when that will really happen though. And even though my mind is currently on cleaning that doesn't mean that I'm not getting a few new goodies here and there. These tiny little wood veneer birds where hard to resist and they are absolutely perfect sized embellishments for us card makers. I also got some tiny stars and hearts that I can't wait to play with as well. I paired the birds up with this On Top of the World Gorjuss Girl because the original image has a couple of birds around her, though I trimmed them away. Oh, and a quick PSA on the Crate Story Teller 6x6 paper pad... the prints are not scaled down from the 12x12 size. Well, one of them is, the blueprint looking paper, but all of the rest are exactly the same which is a disappointment. Especially since the aerial map prints really needed to be shrunk down to work well on cards. I don't get why Crate would revert back to this and I hope it's not a sign of things now that they are under the American Crafts umbrella. 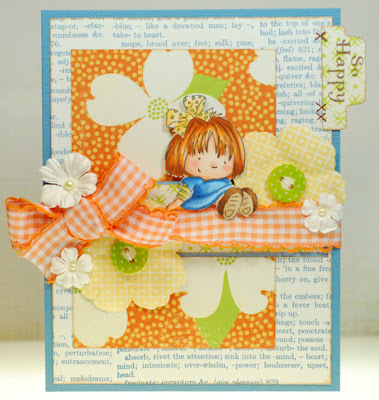 Still, the papers are fun and I love the mix of colors and prints in it... kind of vintage with a summer time vibe. 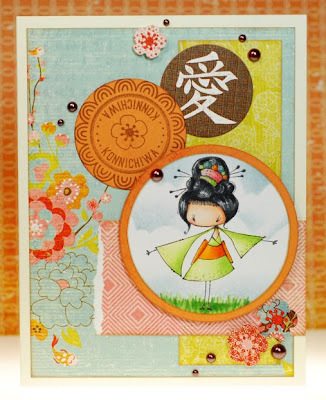 Maybe it was the grey skies that had me toning down the color palette on this card or maybe it was just wanting to pull out the What's Up papers from Basic Grey. It's another line with an interesting color combo going on but it's growing on me. 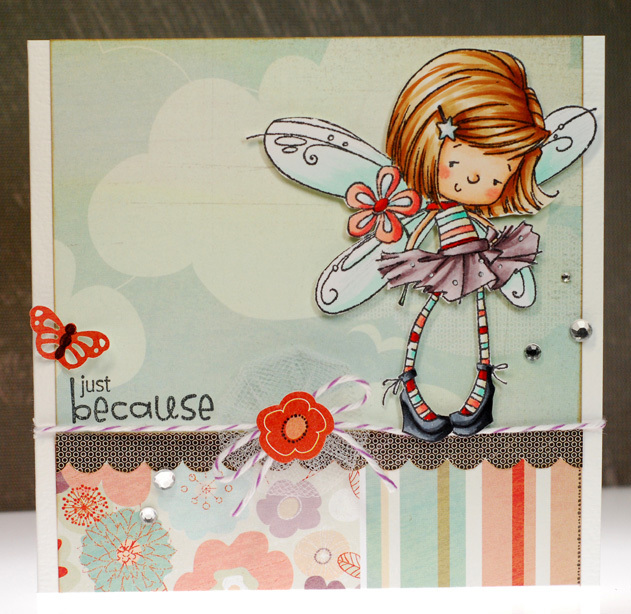 I do have one disappointment with it though... see that cloudy sky paper behind Fairy Glenn Charlotte? Basic Grey didn't include that print in the 6x6 paper pad and I was so looking forward to having it in a more scaled down version for my cards. Le sigh, le pout, le boo-hoo. Oh well, at least I had the big 12x12 sheet to play with. And Charlotte does seem right at home in her slightly over cast sky. It's time for me to go get ready for the day now. So much to do, so much to do. 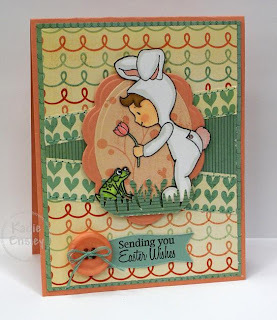 Ok, so there is even more review preview fun and inspiration from the rest of the ATS team on the All That Scraps blog so be sure to hop on over there too! 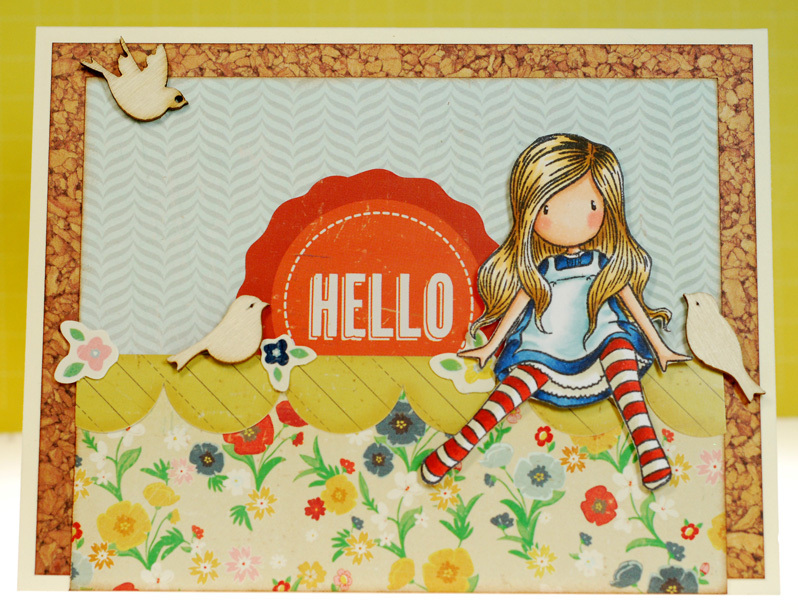 And all of the new April stamps can be found in the ATS store here! It was high time that I inked up one of the last SOG Nouveau Girls that I got, considering the newest NG release is debuting today... yikes, I'm so behind! This fancy lady is called Fan and if you are familiar with these stamps you will notice that she is looking a bit different on my card. Yep, I couldn't help myself and played around with some altering. I just thought that she would look pretty with a bit of extra hair. So I stamped Cupcake Mae onto a scratch piece of paper and used my light box to trace her up-do onto the top of Fan's head (minus the cherry). I think the fancier 'do adds some extra elegance and enchantment to the Spring Goddess look that I was going for. Well folks, I've got a long day ahead of me and I won't get back home 'til late. Hope your week is off to a great start! I finished A Storm of Swords last night and I have to say that it was my favorite book of the series so far. They have all been amazing but whoa, there was just so much to take in with this one. I've had comments asking about the Songs of Ice and Fire series and they are adult fantasy novels that I promise will transport you to another time and place. If you love the Lord of the Rings trilogy then these books will be right up your alley. Now onto my card... I found this little Pure Innocence Ladybug already colored up and cut out while straightening my desk, and since I was in a time crunch again she made this one super quick. 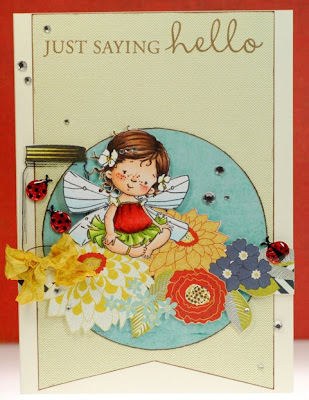 The little ladybug rub-ons where also on my desk and since they are part of the October Afternoon Cherry Hill line that got me to pulling out the matching papers from my scrap bags and just going to town with it all. I know that they are older and I can't really think of an October Afternoon line that I haven't been crazy about but I gotta say that Cherry Hill still remains in my top 3 lines that they have ever made. Love. I'm sorry to say that it's looking like this is going to have to be another hit and run post today. Between work, the beautiful spring weather and trying to finish this book. I'm being pulled in several different directions at the moment. Well, I was supposed to have today off too but I've been called to fill in so I've gotta keep this post short and sweet. Alrighty, time for me to run. TGIF all my crafty peeps! Guess who's enjoying a day off today? Yep, that would be me. So this was one of the rare occasions that I made my card base first without even picking out a stamp to go with it. 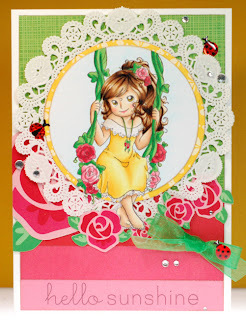 Though I knew that I wanted a small fairy to either sit on the flowers of peek out from behind them. When I grabbed my Sugar Nellie binder sweet Faye was just who I was looking for. Her clothes actually reminded me of a strawberry and considering the name of the paper is PB&J it is an obvious choice. I mean, come on, strawberry jam is THE best on a peanut butter sandwich, LOL! I fussy cut her off of the mushroom she was originally sitting on so that Faye would fit into the over all design. I just love her and all of her freckled cuteness. Plus, she's another one to check off my "ink it up" list. Woot, woot! Ok then, have fun today and be crafty! Ok, now for today's card. What can I say? It is just a Dandy Lion kind of day. 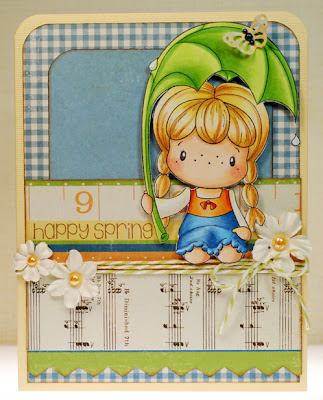 I'm still working my way through the new Kraftin Kimmie flower girls and this little bit o' fluff wished her way right onto my card. She was a lot of fun to color with that downy skirt of hers and all of that crazy hair. I went with a bright and saturated yellow for her locks to kind of represent the dandelion flower before it goes to seed then just used dots of lighter yellows and a bit of that magic E81 to make her look all soft and fuzzy. Then I got to feeling super crafty and decided to try making some small yo-yos out of tulle rather than fabric. I'm pleased to report that they were just as easy to do and I love how they look like decorative little dandelions down around her feet. Well, it's going to be another busy one for me so I should really scoot. I know that I already used some of these Chloe's Closet papers yesterday but considering that great blue in them I thought it would be a nice choice for this stamp as well. But I didn't want it to be as heavy in the blues as my last Rainy Day Birgitta card so that's where the bit of orange and yellow really cheer this one up. I picture this version of her to be at the end of the storm with the sky finally clearing and the sunshine peeking out from behind the clouds. I still added a bit of a green cast to her hair and body with the YG00 but it is a much more subtle look compared to Birgitta with the E80s hair. I also altered her just a bit by drawing in a couple lines to give her dress a separate bodice and sleeves so that I could give her outfit more color too. Alrighty then, I'm outta here. Hope your day is a crafty one! After posting the grass video a couple weeks ago, I received a few requests to share how I did the blonde hair that I used on Easter Anya. This seemed the perfect time to do it so I just had to find a good stamp to showcase the combo on. The Greeting Farm stamps have nice, big heads of hair so I went back to my TGF binder to pick a likely candidate. Cheeky Chat caught my eye and since she hadn't been inked up yet this was a two-fer. I did alter her a bit by wiping away her winking eye and tracing in a new eye in its place. 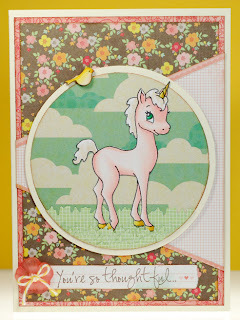 The color combo is a pretty ash blonde and you can find the video here or over on Color Me Copic. Alrighty friends, have fun and stay out of trouble. I'll chat at'cha later! So for today's card I actually inked up a new stamp that I just got this past week. Lili of the Valley recently had a free shipping deal that I took advantage of and I was happy to give this little Blossom a new home. Considering this used to be apple country, I grew up surrounded by the sweet smell of apple blossoms this time of year. And even though the orchards are fewer and further between these days, Blossom on her tree branch was totally calling to me. 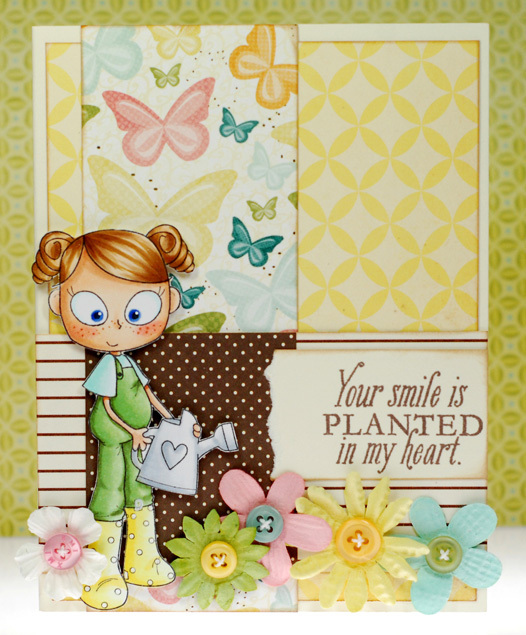 I paired her up with the My Mind's Eye Miss Caroline paper pad because the soft pinks reminded me of apple blossoms and the wood grain kinda looks like the bins that we would use come harvest time. Just the right colors and textures for this tree climbing cutie. So I finished reading A Clash of Kings the other day. OMGoodness, this series just keeps getting better and better! There is magic returning to the world my friends and the pace of the story is becoming quite a ride. I'm already 100 pages or so into A Storm of Swords and I'm finding it hard to tear myself away from the pages. I've been getting less sleep but it is so worth it, LOL! I think it is a fun match up and since I kind of had a circle motif going on I went ahead and added that sticker with the symbol on it to complete the cascade. I have no idea what it means but I'm hoping that Basic Grey didn't trick me into adding some crazy sentiment like, "Eat more soup" to the card. So if anyone knows what that translates to, please share! Well, I should get moving. Lots to do, lots to do! 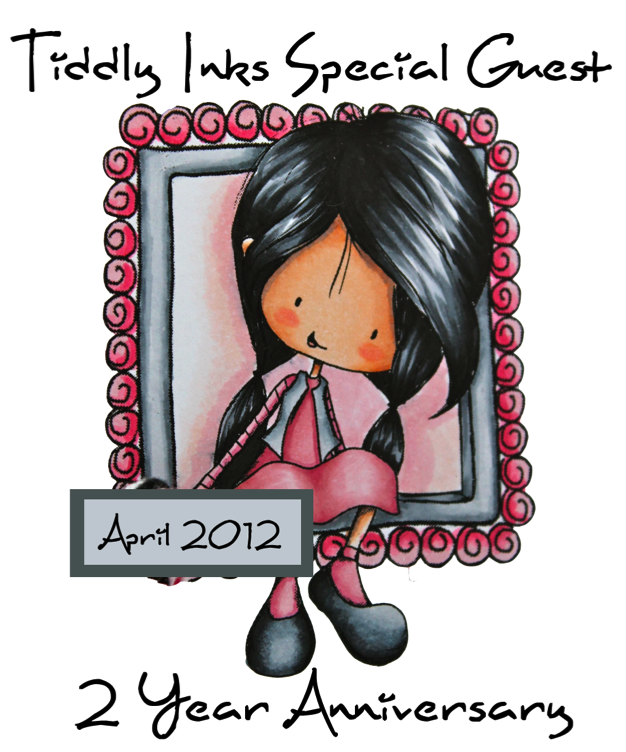 Today I'm a special guest over at Tiddly Inks for their "Frame the Moment" celebration that is going on this month! When I was invited to participate it was a quick and easy YES from me. I love Christy's sweet characters, especially her Pixies, Buggs and the newest addition to the Tiddly Inks family... Wryn. Thanks so much for stopping by today and be sure to check out all the going's on over at Tiddly Inks including 10% off all orders right now. Sweet!